German Romantic composer Richard Strauss had two lifelong heroes: Richard Wagner and Wolfgang Amadeus Mozart. 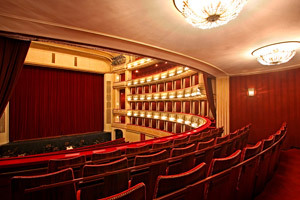 His admiration for the two shines brightly in his dynamic and complex opera Die Frau ohne Schatten, and guests of the Vienna State Opera are sure to identify this masterpiece’s musical and dramatic lineage. Die Frau ohne Schatten (German for “The Woman without a Shadow”) is the fourth collaboration between Richard Strauss and librettist and poet Hugo von Hofmannsthal, a creative powerhouse duo that produced many timeless operas together. Strauss and Hofmannsthal began working on Die Frau ohne Schatten in 1911. The librettist drew his inspiration from Wilhelm Hauff’s fairy-tale The Cold Heart and generously added other literary influences, most notably motifs and whole passages from Goethe’s epic poetry. The resulting libretto was so packed with symbolism, complicated parallel story lines, and character arcs that Hofmannsthal had to write a detail story guide in prose. This ‘straightened’ narrative often accompanies the opera’s performances to help audiences keep up. The basic plotline of Die Frau ohne Schatten is part adventure, part drama, and part fable in which obstacles must be overcome through willpower, character, and love. An Emperor and his Empress are childless; her lack of a shadow represents her infertility. Her father, the King of the Spirit Realm, compels her to acquire a shadow before the twelfth moon cycle ends or else she will be taken back into his custody and out of the human world forever. The ordeals of another couple – dyer Barak and his wife – unfold in parallel. Although he also had difficulties following all of his librettist’s storylines, Strauss found himself inspired to match Hofmannsthal’s complex and symbolic narrative with similarly deep and multi-layered composition. Contrary to his usual ornate and boastful style, this time he turned all his compositional efforts to serving the dramaturgical necessities of the plot. The musical results were a dense and atmospheric score that matched the monumentality of the story. Vocally, Die Frau ohne Schatten features one of Strauss’ most demanding casts, calling for dramatic sopranos and mezzo-sopranos as well as a powerful Heldentenor and a bass-baritone to fill the main roles. Secondary characters are no less challenging, either. Die Frau ohne Schatten was first performed at the Wiener Staatsoper on 10 October 1919 and has since become a staple of the operatic repertoire. It is now coming back home in its full glory and musical as well as dramaturgical richness.